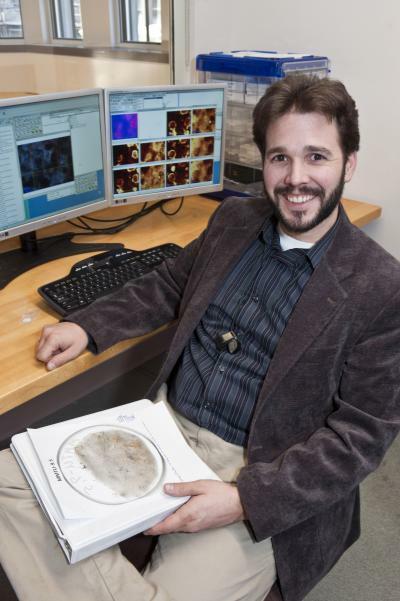 CHESTNUT HILL, MA (5/18/2011) – Carbon found within ancient rocks has played a crucial role developing a time line for the emergence of biological life on the planet billions of years ago. But applying cutting-edge technology to samples of ancient rocks from northern Canada has revealed the carbon-based minerals may be much younger than the rock they inhabit, a team of researchers report in the latest edition of the journal Nature Geoscience. The team – which includes researchers from Boston College, the Carnegie Institution of Washington, NASA's Johnson Space Center and the Naval Research Laboratory – says new evidence from Canada's Hudson Bay region shows carbonaceous particles are millions of years younger than the rock in which they're found, pointing to the likelihood that the carbon was mixed in with the metamorphic rock later than the rock's earliest formation – estimated to be 3.8 to 4.2 billion years ago. The samples come from the Nuvvuagittuq Supracrustal Belt, a sedimentary banded iron formation located in the Archean Superior craton, one of the earth's ancient continental shields. Samples were subjected to a range of high-tech tests in an effort to more clearly characterize the carbon in the rock. Boston College assistant professor of Earth and environmental sciences Dominic Papineau and colleagues report in the journal Nature Geoscience that carbon laced within ancient rock formations may be millions of years younger than the rock itself, raising questions about the evidence of the earliest signs of life. As the planet evolved, rock and other matter was subjected to a range of temperatures that leave telltale signatures scientists can now study. The team's examination found that the rock samples were subjected to high-grade metamorphism. Yet the crystalline structure of the graphite present in the samples was not, leading scientists to conclude the matter infiltrated the rock at a later stage in time, though the exact timing is not clear at this point. The presence of carbon and the specific characteristics of that carbon's source material are crucial to understanding the evolution of the early microbial biosphere. The subject of much debate within scientific circles, a new set of assumptions may be required when using the presence of carbon to date milestones in the earth's evolution.